This rare TI-620 was introduced in the year 1974 and seems to be a sibbling of the TI-450 and TI-500. Dismantling the TI-620 (Thanks, Larry!) is not the easiest job but of great interest. The whole calculator is centered around the huge, self-contained printing assembly. It was manufactured by Japanese Suwa Seikosha Co, LTD., better known under the EPSON brand. It has a red/black ribbon and dimensions are 4.3" x 2.8" x 5.2". There are 15 print columns occupied, but it appears that only 13 of those are for digits and separators; the right two columns are for op codes. The TI-500 uses a calculator architecture based on the TMS02xx/TMS03xx family but misses the usual 12-digit display. Related calculators using this chip set are the SR-20 and SR-22. The first usage of the chip set was the TI-4000 and the Canon 121F. The architecture found in this TI-500 differs greatly from other calculators, it uses two Data-Chips (TMS0203, TMC0221) and two ROM-Chips (TMC0306, TMC0406). A possible reason could be found in the efforts to control the drum printer. If you search in the history of Texas Instruments for the first printing calculator you'll find the TI-5050 introduced one year after this TI-620. 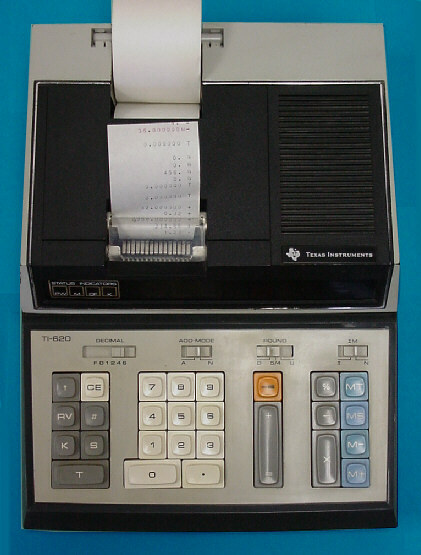 The TI-5040 featured the first combination of a display and a printer in a desktop housing. © Joerg Woerner, March 26, 2002. No reprints without written permission.